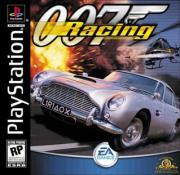 007 Racing marks the seventh appearance of Pierce Brosnan's James Bond; the game included his likeness but not his voice, which is provided by Tim Bentinck. Including many revived characters from previous entries, the game is considered to be a spin-off out of the original chronicles. 007 Racing was met with mixed reviews. Executive sitting there holding two folders: 007 Racing / 007 Goldeneye 2 "I know what people want".